The majority of stroke rehabilitation exercises are made up of a number of different types of things. This is because to drive improvements after stroke you need to change your brain via neuroplasticity, this takes active practice and lots of it. There are a number of different types of exercise that may form part of your stroke rehab program. Your therapy team should work out the best combination for you based on the problems you are experiencing after your stroke. There are specific exercises and strategies you can use to increase strength in muscle that are paralysed. This includes setting up the exercise so it is very easy for the muscle to start to switch on, using electrical stimulation to assist the muscle whilst you exercise and incorporating mental practice. These strategies have been shown to improve strength by helping to restore the connection between your brain and your muscle. They need to be performed many times, 100’s to 1000’s each day, in order to drive neuroplasticity and establish the new connection. If your muscles are a little stronger or you are improving, you can start some more traditional strength training. In these exercises, you will start to increase the resistance and decrease the number of times you perform the movement, so it becomes more like a traditional gym program. You may move to lifting weights or your body weight. 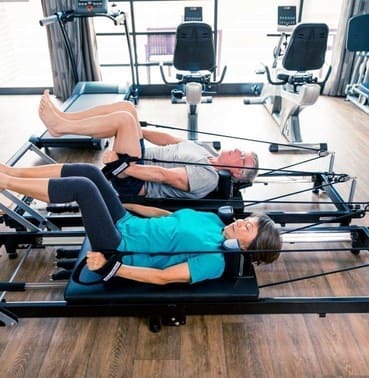 These exercises also work on the muscle-brain connection, however, they also start to work on the structure of the muscle itself. Task-specific training can be very effective at improving your ability to complete everyday tasks e.g. walking, standing up and balancing. Once you have some muscle strength, task-specific training should be included in your rehab program. When practicing these exercises your therapist can help you to find the best set-up to produce the best technique and give you ongoing feedback so you can improve. In this form of exercise, your therapist is like your coach helping you to refine and perfect your technique, in the same way a tennis coach will help the player to refine his/her serve. Because you may not be moving as much as normal or in the same ways, your muscles are at risk of tightening up. In order to prevent this, the number one strategy is to move as much as possible and avoid long periods of sitting or lying during the day. Your therapist may also suggest some stretching or range of motion exercises to assist this, particularly if there is a certain muscle at risk of tightening. As well as being strong and skillful in your movement, you need to be able to continue to move or have good endurance. For example, being able to walk around the shops without getting tired. In order to do this, you need to be fit. Fitness training can take many forms including traditional bike and treadmill training. Modifications may be needed so you can use equipment and complete the program effectively. Fitness training is also very important in preventing further strokes in the future. These are what I consider to be the top five common types of exercises in stroke rehab. These exercises can be completed in sessions with your therapist, with the support of your family and friends or on your own. It doesn’t matter, but what does matter is that you do enough of the right things!